While the world spends it’s time engaged in preventing the spread of Muslim Extremism through Asia Minor and North Africa, North Korea claims to be preparing for the “final destruction” of South Korea. North Korea’s latest threats make a mockery out of the United Nations. Article 2.4 of the United Nations charter prohibits the threatening of force. Of course the rules do not always apply to the backward state because China and Russia seem to always come to it's defense. The North has been testing nuclear weapons in defiance of U.N. resolutions creating a great deal of anxiety for South Korea. The South says it will defend itself with a pre-emptive strike if they feel a nuclear attack is imminent. The North is trying to force the United States to back down on sanctions. It appears to think the best way to do this is to force them to negotiate removing sanctions by continuing the behavior that has made North Korea one of the most heavily sanctioned states in the world. 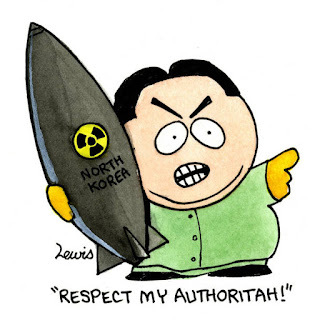 My fear is that this psycho Supreme Leader may be unstable enough to provoke a conflict. If China wants to be respected as a world power it needs to deal with this real life Dr. Evil before he pulls a Jimmy Jones and wipes out the entire Korean Peninsula. That would entail tough actions against Iran and North Korea!